CES 2014 is packed with wearables (even for pets!) and incredibly cool car tech, but the show's bread and butter is still TVs--the bigger and more over-the-top the better. We scoured the press conferences and the sensory overload of Central Hall until our ears were ringing to identify the newest trends coming to your living room...if not this year, then eventually. That HDTV in your living room looks fine, but its lustre will fade once you see 4K, aka Ultra HD, which doubles the resolution on both sides, so instead of 1920x1080, you'd see 3840x2160. This allows 4K content to show much more detail, and the 4K video being demoed on the shiny new TVs at CES is pretty jaw-dropping. You can see reflections in a dew drop on a flower petal. You can see variations in color between the hairs on a puppy's face or the individual barbs on the feathers of a bird. It's pretty remarkable. But high-resolution video like this requires a lot of processing power, not to mention the cost of a high-res screen, so early 4K TVs came with jaw-dropping prices as well. But prices are coming down and will likely continue to fall. The best deal so far is the P-Series from Vizio, which starts at $999 for a 50-inch set, with prices increasing by $400 for every 5 inches, up to a 70-inch screen for $2600. That's really not bad--I saw these TVs and was impressed with the design and quality. Vizio's V6 processor sports a quad-core GPU and dual-core CPU, and the sets support 4K streaming over 802.11ac Wi-Fi, so once Netflix starts rolling out all their original 4K shows (yes, including House of Cards, which was name-checked by every TV vendor in Vegas), you'll be ready. The full-array LED backlighting produced brilliant color onscreen, and the P-series sets have 64 Active LED zones. Active LED divides the screen into a grid, and the backlighting in each zone is dynamically adjusted based on the content being shown. That way colors can stay bright while dark areas of the screen can be stay dark, since the backlighting doesn't have to stay uniform on the whole screen. 4K will keep getting better over time, just not in resolution--8K will come along later to quaduple the amount of pixels yet again. But future 4K TVs will boast a wider color gamut, higher framerates, and brighter displays. If you're worried about winding up sad like the early adopters who snapped up 720p HDTVs before 1080i/1080p came along, Samsung has your back. The company's UHD (for Ultra HD) sets are future-proofed by the Samsung UHD Evolution Kit. That's a detachable box that houses the processor and other crucial components, so you can actually upgrade your TV as the technology advances, without having to buy a new screen. Even though 4K was also touted as the next big thing at CES 2013, this year the whole thing seems to make a lot more sense. Content is coming, and not just from Netflix. Users can create their own, thanks to a 4K camcorder from Sony and a 4K Lumix camera from Panasonic, each to sell for around $2,000. Panasonic's (frankly pretty dorky-looking) A100 head-mounted action cam will be going 4K too. Rovi's DivX 10.1 software will let you encode 4K video on your PC or Mac, even using non4K sources, like high-res GoPro cameras. Amazon Instant is rolling out 4K content this year, and YouTube has some already. The World Cup this summer will be shown in 4K. 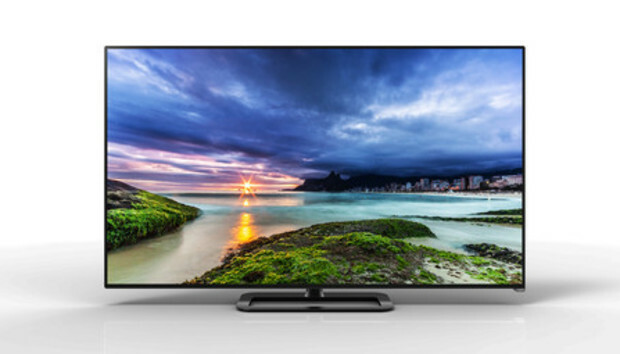 Samsung is working with Comcast and DirecTV to stream 4K video to the company's smart TVs. Sony's Video Unlimted 4K service will add bring more movies and TV shows in 4K, and we were also impressed by the Nuvola NP1, a $299 streaming 4K set-top box that packs 100 hours of free 4K content and another 100 hours for rent, with more to come. In summary, HDTV is still the mainstream for now. If your 1080p TV works just fine, keep using it. But if you're shopping for a brand-new set in Q2 or Q3 of this year, 4K is getting more attractive all the time. We admit it, before the show and even during the press conferences, we thought the curved 4K TVs were a silly idea, a show-off trick, an answer to a problem no one had. ("Yeah, this TV is nice, but it's so...flat.") But when we got to really examine them on the show floor, we were surprised by how great they looked. The actual curve is subtle enough that you forget about it after a bit, but the viewing experience is noticeably better. In the press conferences, execs from LG, Panasonic, Sony, Sharp, and Samsung would use vague phrases like "a more cinematic experience," which didn't really explain why a TV needed to be curved. But at the Hisense booth, a friendly rep gave us the eureka moment that helped our brains understand what our eyes already knew: With a flat screen, the edges of the screen are further away from your eyes than the center, but a curved screen is designed to correct that. You get a wider field of view, and it's easier to be immersed in what you're watching. PC gamers who have set up three monitors in a triptych (you know, with the outer two tilted in toward the center just right) will understand. Of course, it doesn't hurt that curved TVs just have a high-end, expensive look--and they'll be more expensive too. Will the better viewing experience be worth the extra price? For many people, no. But if you can afford it, they sure are nice--we even chose Samsung's 55-inch U9000 Curved UHD TV as our favorite entertainment product from CES. Every single TV we saw at CES was a smart TV. That means they connect to the Internet and feature web browsing and apps: think Netflix, Pandora, Spotify, Skype, Vudu, games, and many more. The problem with smart TVs up until now has been just how confusing and messy the interfaces can be. In fact, according to the NPD, the vast majority of smart TVs are used for watching regular TV, maybe listening to music, and that's about it. The smart TVs at CES are trying to correct this, but some take creepier paths than others. Panasonic's TVs let you customize a home screen for each user, and as you favorite things it learns your preferences and hopefully suggests things you'll like. Oh, and it knows who you are because it recognizes your face. In fact, all you have to do is walk by the TV for an Info Bar to pop up with the time, date, and weather. Vizio's made its entire lineup of TVs smart (although the entry-level E series sets are also available in non-smart versions), and switched from the Google TV platform to Vizio Internet Apps Plus, based on Yahoo Connected TV. The navigation is much improved, and the remote control makes it easier to search for content thanks to a backlit QWERTY keyboard on the rear. But our favorite interface is from LG--the company is using webOS to completely revamp its smart TV platform. The new launcher is a scrollable menu that pops up along the bottom of the screen, letting users flip through the cards and choose new content without having to go back out to a home screen. LG is also trying to simplify setup by sending an animated character named BeanBird to walk you through connecting your new TV to your network, cheering you on after you complete each step. And as you plug in external devices into your TV, webOS helps recognize them and pop up relevant menu options automatically. Better yet, LG's newest LAB540W model SoundPlate will let you add advanced features to your current TV, including Bluetooth, connectivity, and the same smart TV interface. So even if you aren't ready to take the plunge into 4K or a brand-new smart TV, you won't be left behind. It seems like 2014 is the year of the television--or at least it will be once the companies announce firm release dates and prices for all this shiny new gear. Load up on snacks and get comfy on the couch, because there's going to be a lot to watch.